Owners of Mooch Rachel and Paul Roberts have opened their second store in Bell of Northampton. Christmas has come early at the Bell of Northampton as the store officially unveiled its £250,000 extension. Historically Bell of Northampton, based in Kingsthorpe Road, has been well known to customers as a kitchen, fireplace and bathroom business but managing director Graham Jackson has changed the face of the shop over the past five years to become more of a lifestyle brand too. The new extension plays host to a brand new Christmas department - open all year round. On Wednesday (September 19) the mayor of Northampton Tony Ansell cut the ribbon to officially open the new extension, which features St Giles Street favourite MOOCH, a deli called The Cheese Kitchen @ Bell, a Christmas gift department, intelligent homes specialist IndigoZest, Rose Gallery and a 120-seat restaurant. 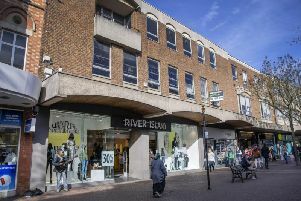 Managing director Graham Jackson said: “We looked at the market and clearly most of the department stores in this area are closed - the quality of the garden centres is very mixed, and we decided many years ago that we wanted to be a lifestyle store rather than just a design showroom. “We’ve added 10,000ft of gifting, including a deli, a large art gallery, and MOOCH have opened a second store here too. "We have a Christmas shop and we have a 120-seat designer restaurant with the most decadent wallpapers you’ll ever see in your life. Stuart Churchman has opened The Cheese Kitchen at Bell - selling meat, cheese and alcohol from all over Northamptonshire. “We’ve added smart home concessions and a new interior design department as well." Once a family run firm, Bell of Northampton first opened in 1898 and is still going strong 120 years later. Mr Jackson added: “I guess the most important thing is you can now come to Bell and buy pick-up products: home accessories, gifting, Christmas and we have a delicatessen. "We have both London-based brands and Northampton brands that you probably can’t get anywhere else, in Northamptonshire certainly, and they’re gorgeous." The mayor of Northampton Tony Ansell pictured next to the mayoress Jayne Crofts and Bell of Northampton managing director Graham Jackson. He also revealed that plans are in the pipeline to dramatically extend their outdoor offerings too, with an outdoor cookery school and workshops, by Spring next year. Bell of Northampton now measures 20,000sqft and has started trading on Sundays for the first time ever - altogether creating 11 jobs. An array of gifts can be bought for any occasion at Bell. Pictures: Kirsty Edmonds. Gift shop worker Jenny Tennant.